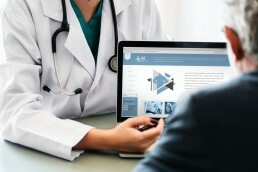 Sites like “Rate MDs” and “Healthgrades” have introduced competition and popularity into healthcare, giving patients a public forum for rating their doctors and medical staff. And since those sites can be accessed right from the patient’s pocket, the modern patient is more discerning, more well-informed, and more likely to “shop around” than ever before. While online opinion reviews are hardly scientific data, it doesn’t change the fact that patients are reading — and writing — them. How can technology like medical tablets, social media, and digital menus help patients feel satisfied, engaged, and optimistic about their healthcare stay? While “the customer is always right” may be a misunderstood and overly simplified expression, knowing how patients feel about their healthcare experience is the first step to understanding how effective policies and staff training are in fostering patient satisfaction. Of course, the HCAHPS survey (Hospital Consumer Assessment of Healthcare Providers and Systems) is valuable information, and the public reporting of the data makes it a vital component to any satisfaction initiative. However, surveys like HCAHPS are more about experience and quality of care than direct patient satisfaction. Knowing where the facility or staff needs work can point the way to future strategy. However, without understanding what causes dissatisfaction, the patients remain unengaged, and it becomes hard to turn that data into actionable intelligence. Plus, it’s all in the past – we need to know what can help a patient right now. What if an easy-to-use touch screen medical computer or medical grade tablet could be located bedside by the patient, during their stay, to chart their needs? What if a kiosk — containing a medical panel PC — down the hall allowed the patient (and even visitors) to try to express themselves in real time? Then, surveys become less about scores and grading and instead become a way to engage and satisfy the patients currently in the facility. No matter the size of your hospital, facility, or doctor’s office, keeping an eye on social media related to your practice is a wise decision. Whether you’re big enough for a team of social media experts or just want an admin to pull double-duty, checking for mentions of your hospital or practice can keep your finger on the pulse of patient satisfaction. It also helps you respond to complaints and unhappy patients before they can influence the decisions of anyone who may be listening. Consumers are turning to social media more than ever to vent their frustrations with companies and products, and companies who respond poorly (or not at all) sometimes find themselves facing down a PR firing squad of angry tweets and righteous think-pieces. Set up Google Alerts that mention the name of your practice or hospital, and make places like Twitter, Instagram, and Facebook top priority for your customer service attention. While we don’t always like to think of a hospital, dentist, or medical practice as a product, be assured that patients do. We’ve all heard the number one complaint by comedians everywhere about their stay in either the hospital or on an airplane: the food. The food isn’t good, or it’s slow, or it arrives while the patient is in an operating room somewhere and ends up going to waste. Or, the wrong food shows up, or the right food doesn’t show up at all. It seems like a minor complaint, but food waste can be a very real concern, not only from a budgetary standpoint but from a health one as well. Patient satisfaction can be directly improved by implementing a better system for ordering, tracking, and delivering food. It’s also better for patient outcome: custom-ordered food is more likely to be preferred and eaten, which could help overall consumption and patient nutrition. One option is to have one of the nutrition staff come around with a medical tablet they can hand to the patient, who can then choose their own food from the menu. Satisfaction gains are obvious — choosing the food you want to eat and getting it makes people happy, and lowers the chance they’ll get something they don’t like. Keeping it digital makes it easier to enforce patient diet — if they’re on a clear liquid diet, for instance, that flag will be on the patient’s profile in the system, presenting them with only the appropriate options. A medical tablet also allows easy sign-on for the patient: the nutrition staff member could use a medical tablet’s built-in barcode scanner to read the patient’s wristband and then receive all relevant dietary data. The system can be built with a number of patient flags designed to reduce food waste, patient malnutrition, and increase satisfaction. Since patient-tracking is already de rigueur in most hospitals, you could easily tie that information from the patient’s profile into the nutrition system. Nutrition workers won’t bring food up to empty rooms and let it go cold — their medical tablet or their computer in the kitchen will tell them if a patient is out of the room for a procedure, and can delay the meal for a better time. This reduces food waste and increases patient satisfaction — when you haven’t eaten a meal in a day or two, and miss your first dinner because you were out for a procedure, you’re going to be pretty angry when you get back. Consider how digital menus can improve the patient experience, and how easily they would be able to tie into pre-existing patient systems. These are only a few of the ways hospitals and medical practices can leverage technology to improve patient satisfaction. To find out more methods for improving patient satisfaction and engagement, or to talk to an expert on how to integrate medical computers into your practice, contact Cybernet today.